St Peter’s, Chetnole is a pretty and very typical rural Dorset church with a long history. It is at the heart of the village, and the popular village pub is close by. The openness of the churchyard is one of its attractions, and helps the church to be seen to its best advantage. St Peter’s dates from c13, including the nave, the south door and a lancet window. Later features date mostly from c15 including the barrel vault and the tower, which was rebuilt at least in part in the c16. The four gargoyles on the tower are of particular note. The south porch is later. 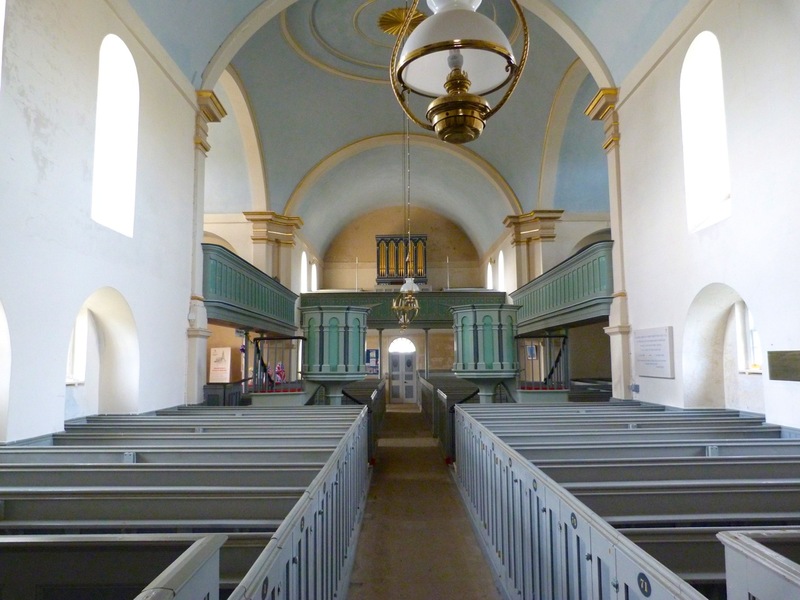 In the mid-c19, the church was enlarged (controversially, apparently) with the addition of the north aisle, and the chancel was refurbished. The clock was installed in soon after (and remains reliable). I couldn’t find the trace of a medieval scratch dial, though (see Sundials) other local churches have one. 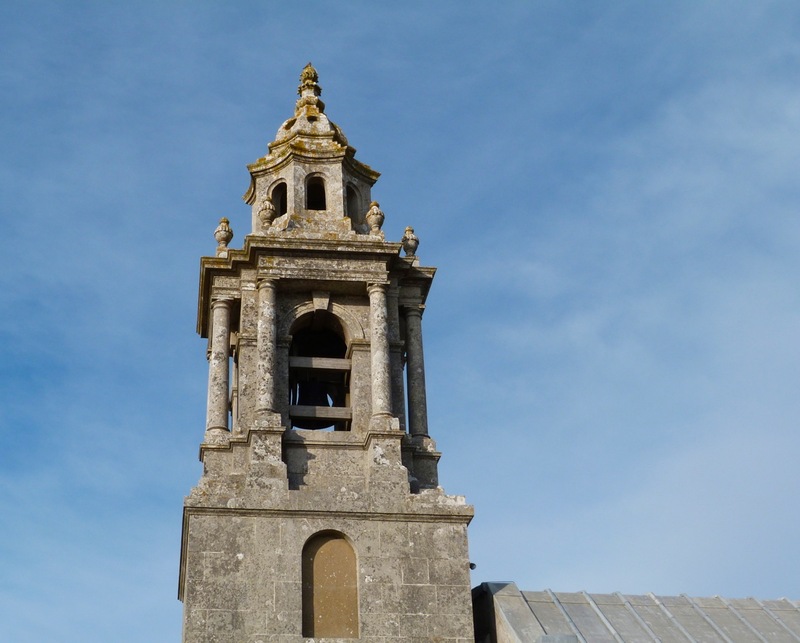 The bells are of particular interest, with the first and second of the three being among the oldest in Dorset. They were cast by a London founder, William Chamberlain, in about 1500 and inscribed respectively: wox augustinae sonet in aure dei (‘the voice of Augustine speaks in the ear of God’), and sante laurenti ora pro nobis (‘St Lawrence pray for us’). The third (tenor) bell was cast in 1865 by John Warner and Sons of London, and weighs about 8cwt. The fittings are not suitable for ringing, so the bells are chimed. St Peter’s is worth making a detour for if you are in the area, not least because of its attractive setting, and after visiting the church the proximity of the pub with its ales, food and garden for those with a thirst after righteousness to quench. The village of Piddletrenthide in Dorset lies by the upper reaches of the River Piddle, Dorset’s most amusingly named river. Like its close neighbour, the larger River Frome, the Piddle flows roughly ESE to Poole Harbour. Piddletrenthide is an interesting village for many reasons, but I am heading straight to the northern end, to All Saint’s Church which dates from C12. And I’m zeroing in on the porch. As you can see, centrally above the porch entrance is, firstly, a badly degraded tablet (only the letter A is clearly visible). Above it is a fine, well-defined sundial. 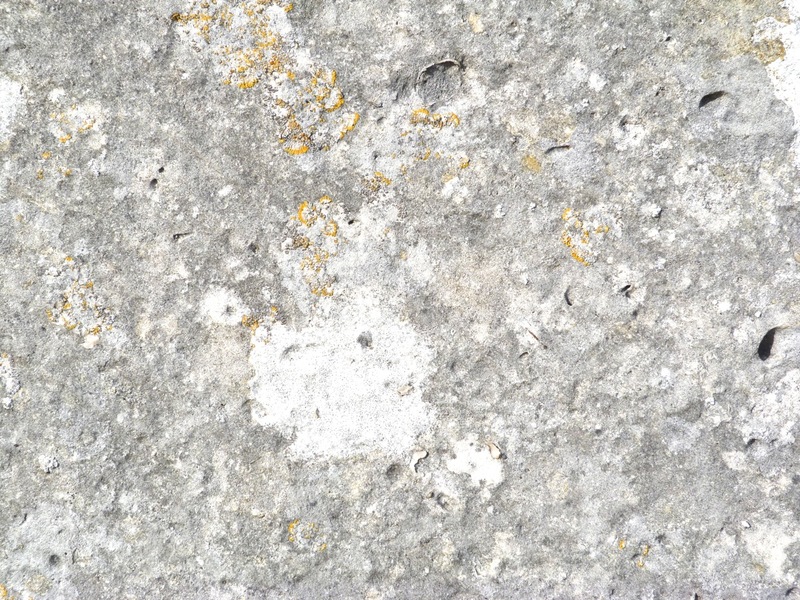 Probably, the experts would not call it a mass dial at all, since it is not actually cut into the church’s stonework, but is on its own block stapled (now anyway) to the church wall. As British History Online (a great resource) puts it, Sundial: Above entry to S. porch, rectangular stone slab with enriched border, Roman numerals, wrought-iron gnomon and date 1602. There’s no doubt about the date. ‘1602’ is completely clear, though the preceding inscription is harder to decipher. By sight, I could only clearly make out the words TO BE, as mentioned by the British Sundial Society (see below). Photographs taken on a sunny day reveal more, and I have done a bit of work on one of them – making it black and white for a start. I believe the legible part of the inscription reads OCTOBER ? ? 23 (possibly 1523). A ladder might make the task of completing the inscription easier! The design is rather more sophisticated than earlier dials. For a start, marking the canonical hours is by now a thing of the past; this dial is on the 24-hour clock that arrived with the early timepieces. The dial marks from 6am to 6 pm, but it is old enough for IV to be rendered as IIII. Also, this is a ‘scientific dial’. With very early dials, the distance between the markers was equal, an inherently unreliable system throughout the year. Gradually, dials acquired graduated markers that narrowed towards the lowest mark, and widened after it. This provided greater accuracy. 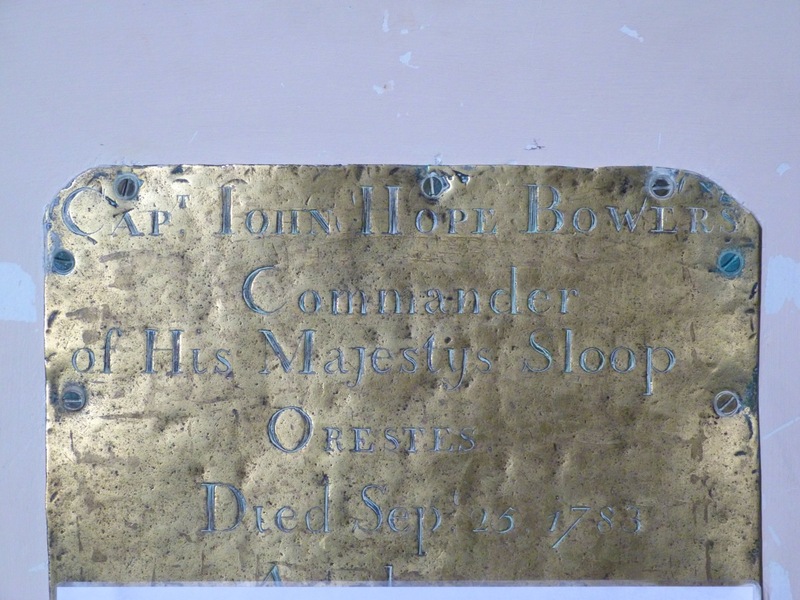 Among the earliest – if not THE earliest example – is at LITLINGTON CHURCH in East Sussex. The above photograph shows the stubby gnomon. I assume it is not the original one. I must have taken this photograph around midday. The face is decorated with a lattice design on both sides, the right side being rather more worn. In addition there are two attractive roundels with a design I can’t make out. A Maltese cross, perhaps? The British Sundial Society describes the dial thus: Shows 6am to 6pm in half hours. Two circular motifs cut into either side of gnomon, decoration cut into dial sides. IIII for 4pm. Triangular sheet gnomon with lead fixings – possibly not original. A possible inscription at bottom “.. ..To Be.. ..” . All Saints is a fascinating Church, both outside and inside. There are many inventive gargoyles and other carvings; and the interior is very rewarding. Another post about this church will follow in due course. Meanwhile, as a side note, the Piddletrenthide Parish Records detail a most interesting fact that will have me revisiting the church for sure: The first known use of Arabic numerals can be seen in an inscription on the west door of the church tower ‘Est pydeltrenth villa in dorsedie comitatu Nascitur in illa quam rexit Vicariatu 1487’. The use of Roman numerals continued in Europe for at least another century so it is quite something to find Arabic numerals inscribed over a doorway in a small village in Dorset. Toller Porcorum is an archetypal Dorset village, right down to a latinate name redolent of medieval swine-herding (cf Ryme Intrinseca, Kington Magna etc). The fine Church of St Peter and St Andrew lies at the heart of the village, and is also very ‘Dorset’. While I was fishing on the nearby River Frome a couple of weeks ago, Mrs RH visited some churches in the area, including this one. Inside, she noticed an unusual modern ‘glass sundial’ set in a stained glass window, a marker of the hours and the millennium. 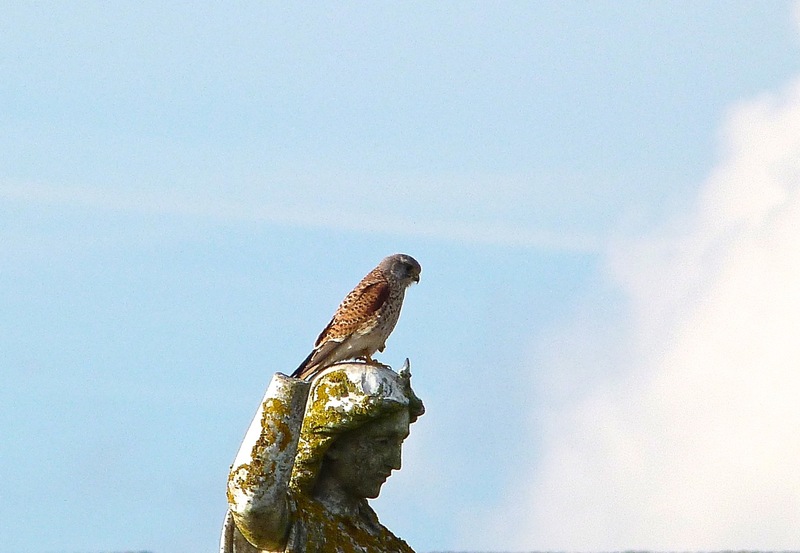 Knowing that sundials are one of the features on this blog, she took a few photographs with her phone. They have come out very well. In the close-up above, you can just make out the shadow of the gnomon at approx 12.40 (midday being at the bottom). On the outside the gnomon, in the right-hand window (below), is elegantly simple and unobtrusive. 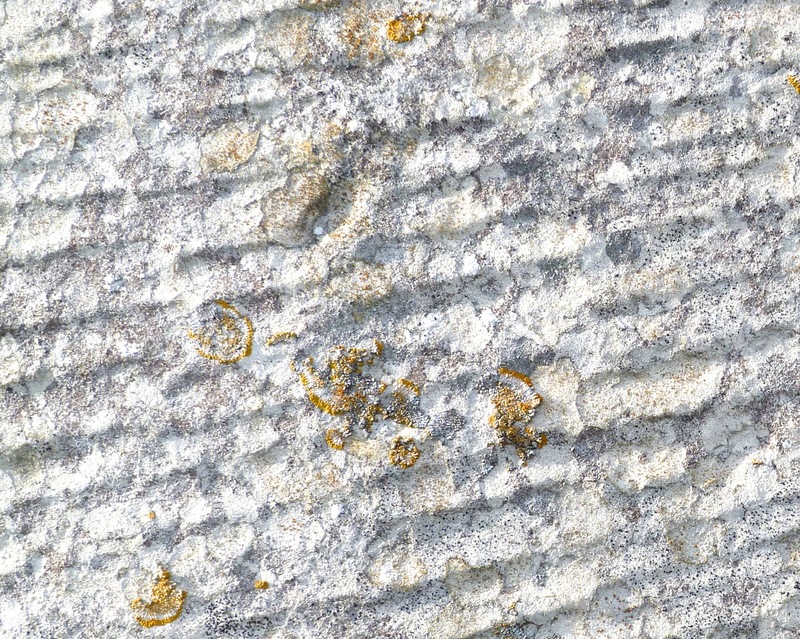 The close-up shows it more clearly. But of course the effect is meant to be seen from the inside, if only to time the length of the sermon. Lordy, but I am negligent of this site. Thanks you, kind people who still come to look at stuff here even though (I am ashamed to note) my last post was in November 2017. I’m going to try to get back on track with this side-project… there’s quite a backlog of material! Milton Abbey, more properly called ‘The Abbey Church of St Mary, St Sansom and St Bradwalader*’, is a former Benedictine monastery founded in c10. The present building dates from the c14 and c15. The Abbey, with a post-reformation country house attached where the monastic buildings used to be, is now a school. The Church building consists of the tower, transepts and choir. The nave is entirely absent, not as the result of the reformation’s destructive zeal (though that may account for the absence of statues in the empty interior niches). In fact, the nave was never built. The blank arch on the ‘front’ side (below) indictes how huge the nave – and the completed edifice – would have been. We enjoyed a c15 pun high on a wall inside the Church. The date shown on the device looks at first sight to be 1618, but is in fact 1514. Medieval numbering was not formed in quite the way we are familiar with now. The W stands for Abbot William of Middleton (the original town name, shortened to Milton), with his rebus, a mill on top of a tun. Close to the Church, there is a small stone circle about which I became quite excited. Sadly, a complete lack of mention of this circle in any historical context suggests that it is a modern imposter, perhaps related to a school project. But it’s pretty convincing! *Me neither. And online research doesn’t disclose much about St Bradwalader. Or indeed anything at all. St Mary’s Church in Melbury Bubb, Dorset stands on a hillside deep in Hardy Country. In The Woodlanders, the hamlet is called “Little Hintock”. The little-known church contains a particular pre-conquest treasure – a well-preserved c10 Anglo-Saxon font of great beauty and intricacy of carving. Simon Jenkins calls St Mary’s a “single treasure church” and praises its extaordinary “lack of pretension”. This remains one of the few un-electrified Dorset churches, with oil lamps for light and a coal-fired stove in the nave for warmth. The solitary church at nearby Hilfield is another. The interior has a carved wood rood screen and wooden ‘waggon’ roof. The stove and oil lamps are visible. St George, Portland stands high up on Portland, Dorset. 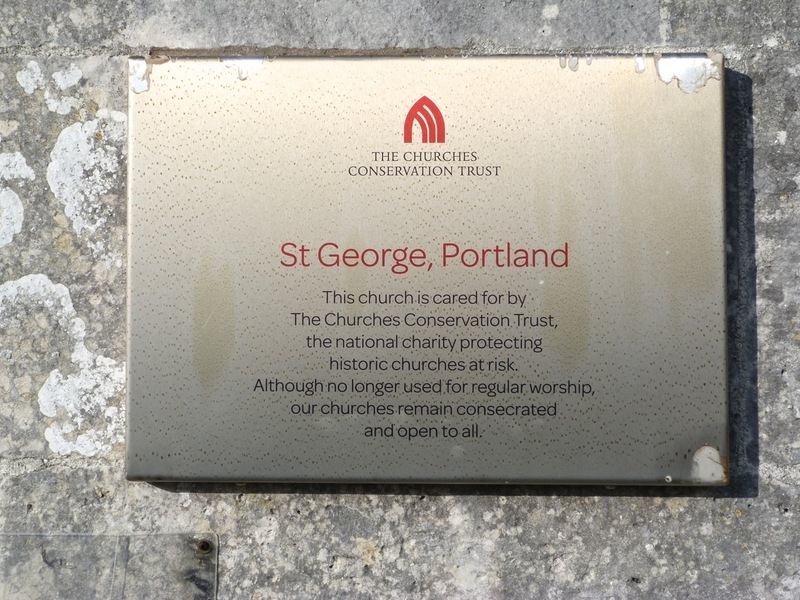 Built from the famed local Portland stone in an unusual mish-mash of styles, it is now in the care of the Churches Conservation Trust, which will at least ensure its survival even if services are no longer regularly held there. 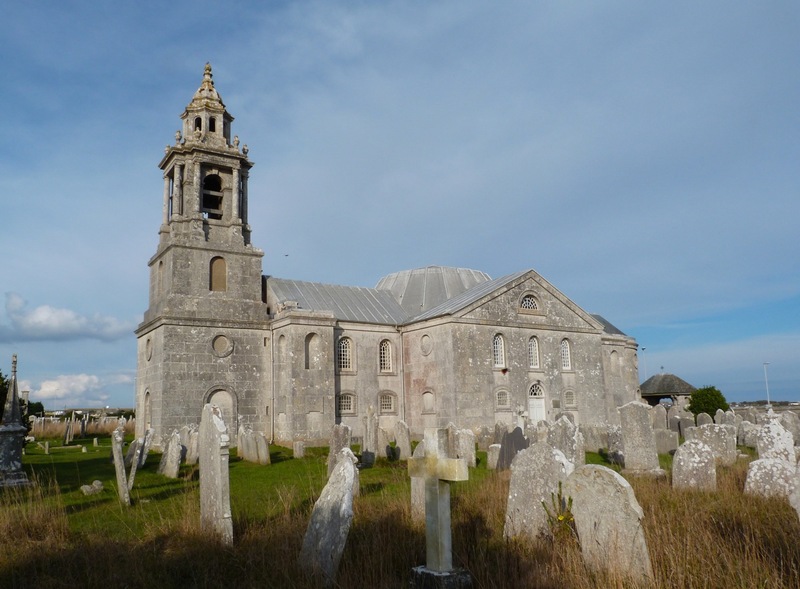 Pevsner calls it “the most impressive c17 church in Dorset”. 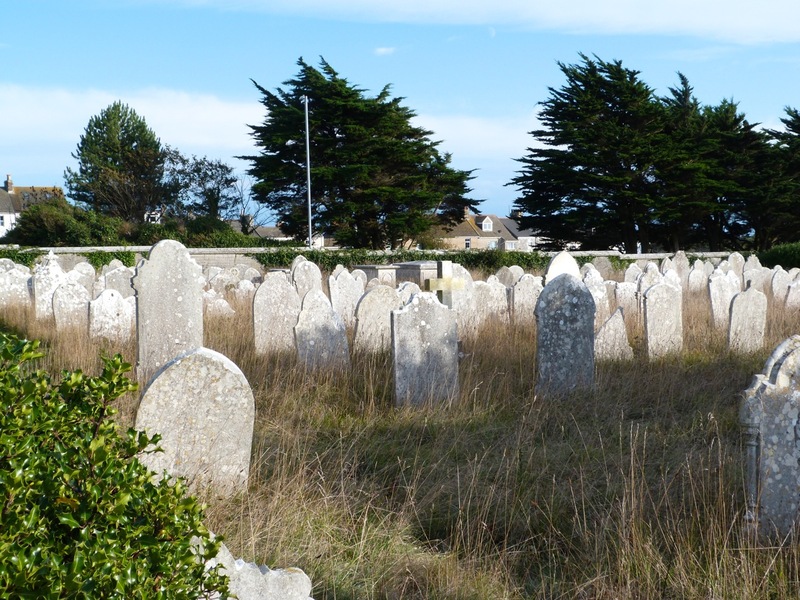 The church and churchyard contain plenty of reminders of Portland’s past both as a significant stone quarrying area, and as a place of major nautical importance. 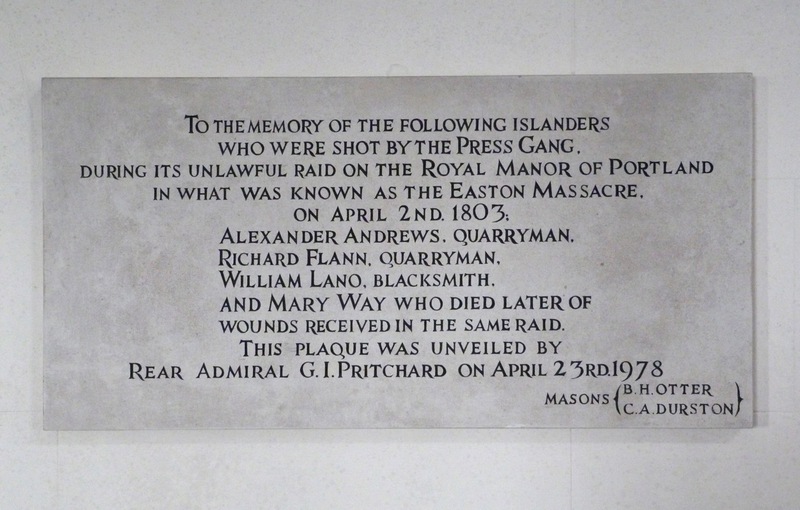 There can’t be many churches with a memorial for those killed by a press gang. 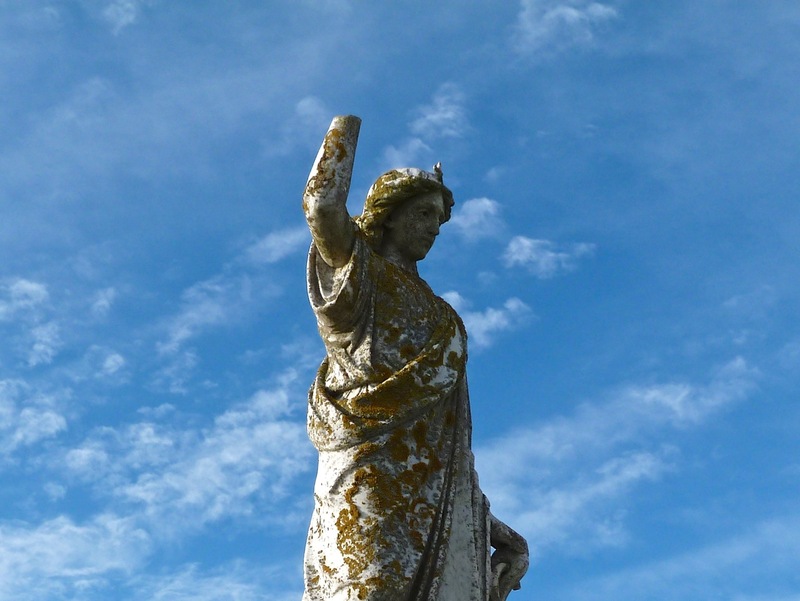 The churchyard is rather wild in places and contains some large commemorative statues. 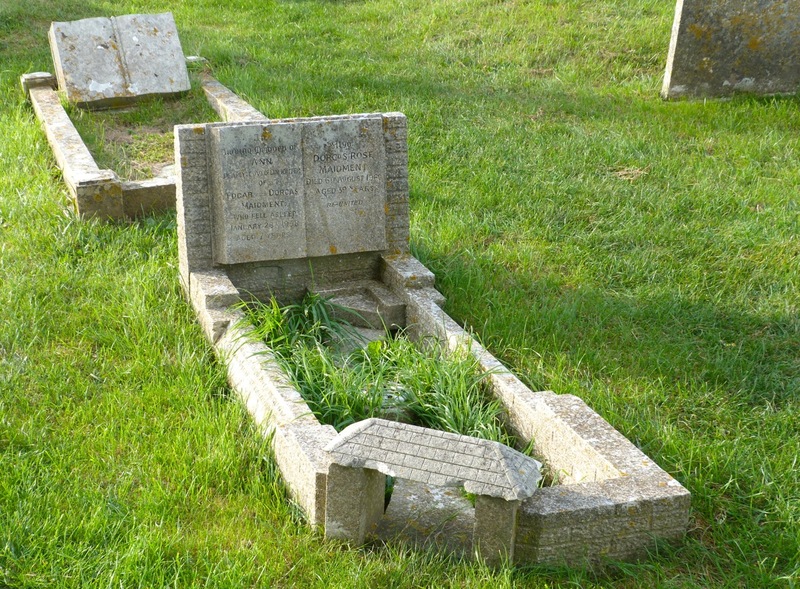 We were intrigued by one quite tidy grave (below) and were left wondering about the design – the little roofed gateway, the raised apart in the top right corner. What does that indicate? 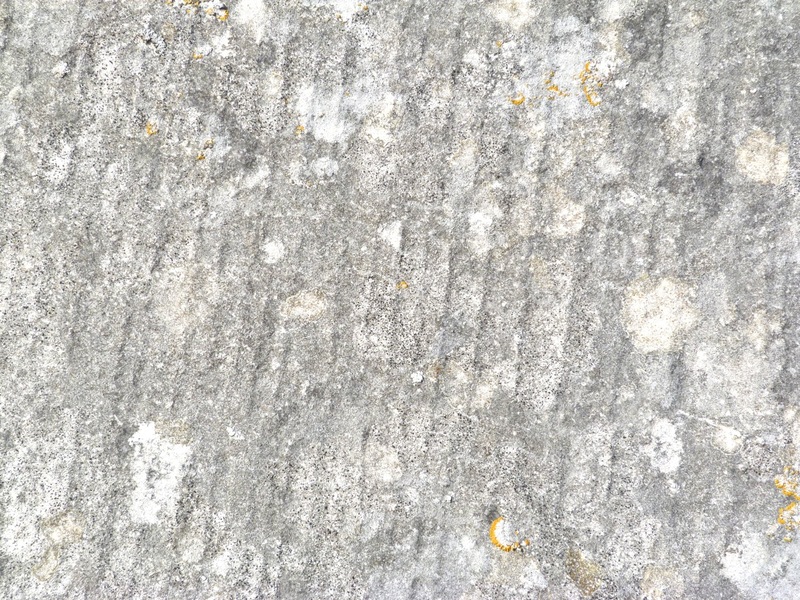 The thick grey walls of St George are typical of the local stone.